HG's Updated Chili's Survival Guide! HG Heads-Up: The sodium content of the food at Chili's and similar chain restaurants is often pretty high. If you're watching your salt, you may want to shy away from restaurants like this. The appetizers are bad news. Trust us -- there is not one item with less than 700 calories and under 50g fat per order. That's hardly a smart start. Get in the house! The regular house salad, without dressing, has 80 calories and 3.5g fat. (See our dressing picks in the Salad Menu section below.) Skip the cheese and croutons, and it'll be even lighter. This is your best bet to start off your meal. Keep away from those chips! They might seem reasonable because they're served with salsa and aren't bogged down with cheese but, um, THEY'RE NOT. These sneaky tostada chips clock in at 910 calories and 45g fat! While the calorie counts per cup aren't disastrous (120 - 250 calories), the fat content in Chili's soup lineup is a bit high for us (5 - 16g per cup). A bowl clocks in at 240 - 480 calories and 11 - 33g fat. However, since there are SO many nutritional grenades on the menu, you could do worse. The lightest pick is the Southwest Chicken. The Original Chili is not included in the above, with 400 calories and 27 grams of fat for a cup it is best to skip it. Is the Salad Menu Safe? The short answer is no; the helpful answer is "only if you make special requests." Overall, ditch fatty extras like cheese, tortilla strips, and croutons. Dealing with the dressing is key -- ask if they have any no-fat or low-fat options (not all do). Don't be fooled by the health halo of vinaigrette -- the citrus balsamic packs 250 calories and 25g fat! And if you wanna get zesty, use salsa. If ordered as is, this salad includes 200 calories and 17g fat worth of honey-lime salad dressing! 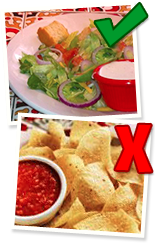 Get a 50-calorie side of salsa or one of the aforementioned dressing picks instead. HG Shocker! 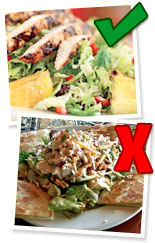 Just say no to the Quesadilla Explosion Salad -- 1,400 calories and 93g fat! Click here for a make-at-home swap. And check out the next section for another smart salad find. To slim it down even more, skip the cheese and/or swap out that dastardly honey-lime vinaigrette for salsa. Topped with mango glazw, mango pico, and avocado. To save calories, request double broccoli instead of rice. Just ask nicely! Topped with pico de gallo and served with broccoli. PERFECT. Includes rice and broccoli -- ditch the rice and boost the broc for fewer calories and more fiber. If you want to save some fat and calories, skip the rice and tortilla strips. You'll still have plenty of chicken and beans to fill you up. "But HG, what about dessert?" No safe desserts here, Snookums. Head home and nibble on your favorite guilt-free sweets there. Click here for some of our latest recipes, and click here for some sweet store-bought treats! Pass this to all the Chili's superfans in your life -- click "Send to a Friend" now! Today, March 30th, is National Turkey Neck Soup Day. We're partial to chicken soup, so we suggest making some Hungry Chick Chunky Soup. Feel free to use turkey breast instead of chicken!